Wayne Suttles has devoted much of his professional life to research on the cultures of the Native peoples of the Pacific Northwest, especially the Coast Salish of the Georgia Strait-Puget Sound Basin. Born and raised in this region, he has been guided by a life-long love of its natural environment and wish to know how its Native peoples lived in it, understood it and felt it. In 1946 he began ethnographic field work with the Straits peoples and in 1951 presented in his Ph.D. dissertation one of the fullest accounts that we have of the fishing, hunting and gathering foundation of a Northwest Coast Indian culture. He is probably best known for his contribution to the ecological” approach to the Northwest Coast. In essays included in this volume, he was the first to challenge the received wisdom that Northwest Coast Indians lived in perpetual Eden-like abundance and that their lavish potlatches were merely the expression of cultural values gone wild, and he was the first to suggest that cultural differences within the Northwest Coast may be related to environmental differences. These essays have had a lasting impact on the study of the Northwest Coast, provoking argument and suggesting problems for research and hypotheses to test in both social anthropology and archeology. Other essays deal with Native knowledge, belief and art, with Native responses to the European invasion, and with the prehistory of Northwestern North America. All are updated with references to more recent works and the author’s own reconsideration of some matters. Wayne Suttles (1918–2005) was an American anthropologist and linguist. He was the leading authority on the ethnology and linguistics of the Coast Salish people of British Columbia and Washington State. He was Professor of Anthropology at Portland State University. 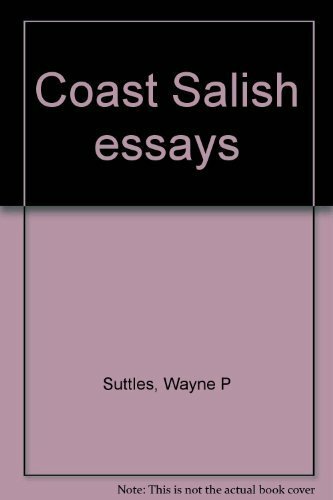 Coast Salish Essays is a collection of his key contributions to an ethnographic understanding of the Native peoples of the Northwest coast.